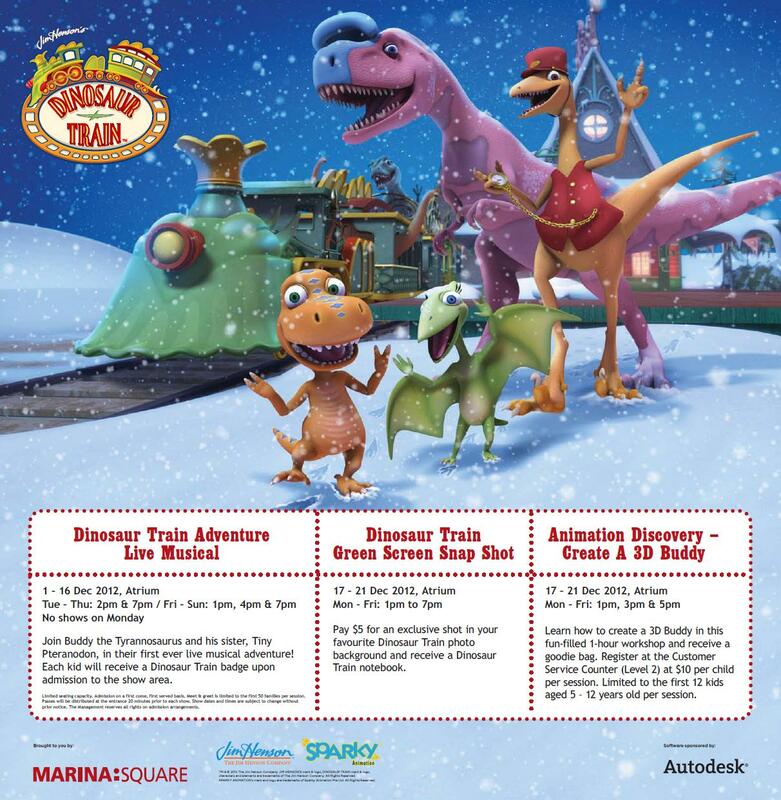 For the first time ever, a collaboration between Sparky Animation, X System and Marina Square Singapore, Dinosaur Train Live Musical will be staged at Marina Square Mall from Dec 1 to 16, 2012. The musical is free to public and is held at the atrium of the mall. This 22-minute musical will feature characters from the popular Dinosaur Train TV animation, Buddy, Tiny, Mr Conductor and King Cryolophosaurus. And there will be 2 other fringe activities held from 17 to 21 December following the show. One is ‘Dinosaur Train Green Screen Snap Shot’ you can take a photo at the Dinosaur Train Green Screen Photo Station and pick your favourite photo background just for $5. You will also be given a specially printed Dinosaur Train notebook with the photo. The other interesting activity is the animation workshop where kids ages from 5 to 12 years old can learn to create Dinosaur Train’s characters in stunning 3D at the 1-hour workshop. The registration fee per child per session is $10 and there will be 3 sessions at 1pm, 3pm & 5pm daily. Each participant will bring home the created 3D character and a goody bag. Come and join us the unique experience in Marina Square!